Apparently, the T-Mobile G1 now accounts for 20% of the carrier’s contract sales here in the UK, a figure that I find quite surprising considering I’ve yet to see a single handset in the wild (aside from on display) nor do I know anybody who’s bought one. This is in complete contrast to Apple’s iPhone, which seems to have spread like wild fire amongst my own social circle, and is quite a common site out in public. The G1’s lack of visibility, I’d mistakenly attributed to poor sales, based on what I still believe has been lackluster marketing and a rather muddled ad campaign – something that can’t be said of the iPhone. Back in November I noted the lack of display advertising for the G1 at Carphone Warehouse, one of the UK’s largest mobile retailers on the high street. 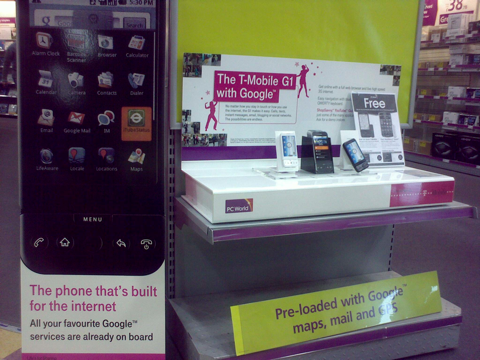 However, today I popped into a PC World, of all places, to find the G1 being heavily promoted, with a much clearer message than the current TV ad campaign: “The phone that’s built for the internet. All your favorite Google services are already on board”. A message that appears to be getting through. Nokia's Comes With Music is everywhere, but is the message getting through? Why has Nokia's 'Comes With Music' been a flop in the UK?